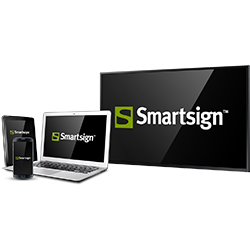 Smartsign is a worldwide leader in software for Digital Signage, the industry term for publishing any type of content on any type of display/screen or device such as tablets and smartphones. The Smartsign Display Manager is the ultimate solution for Digital Signage. Over the last 20 years, Smartsign has been a key player in thousands of simple as well as complex Digital Signage installations around the world. Smartsign is a publishing system that handles all kind of content and publish it on the right place in the right time, on any device.